When the government shutdown began on Dec. 22, no student could have predicted that it would become the longest in the history of the United States. With Congress and President Trump unable to reach a compromise regarding border security funding, students have started to voice their own opinions. The shutdown resulted from the lack of House and Senate votes required to agree with President Trump’s funding demand of $5.7 billion for a U.S.-Mexico border wall. The wall was initially a promise Trump made during his 2016 run for president when the candidate mentioned the wall would be paid for by Mexico, a project which has made no progress following the election. As of Jan. 26, the shutdown was ended in its 35th day, marking it as by far the longest government shutdown in U.S history. The shutdown affected federal workers across the country, from National Park rangers to TSA employees. On Jan. 7, in his Oval Office speech to the nation, the president asserted that the U.S. is in a “growing humanitarian and security crisis” that can be easily solved by an agreement to fund a steel wall along the southern border. On the Carmel High School campus, talks of the shutdown and its effects have been voiced by many. Students have expressed concerns about parents and relatives not getting paid, while on the other side of the spectrum, some students argue for an immediate agreement to fund a border wall. So what do the students think? Can a resolution be reached? In a recent poll sent out to the students in Civics, Economics and AP Government, CHS seniors got the chance to voice their own opinions. Nearly 30 percent of students mention that they don’t understand the government shutdown and why it has occurred, but 70 percent of students surveyed believe border security should be improved in the U.S. Despite the ripple effect of the shutdown, many students were yet to receive an explanation from teachers or fellow students as to why the shutdown occurred. Of all students surveyed, none specifically mentioned discussions or seminars in class regarding the situation at the border. On the other hand, nearly 25 percent of seniors cited that the shutdown has affected them or someone close to them. The most common issue cited was a lack of payment to family members who work in federal positions. When commenting on how the government shutdown affected her, one senior mentioned that her close friend’s father was working without pay. Another senior expressed concerns that families are in the armed forces and are not receiving compensation for their service. Other seniors concern with the fact that their relatives regularly receive government aid, which was suspended for nearly a month as of Dec. 22. Among other surveyed seniors, Stannard cited environmental concerns at the border. Environmental activists and experts comment that there’s plenty of evidence that a border wall could serve as a damaging climate mistake. While many students voice concerns about the negative effects of the government shutdown, the debate isn’t one-sided. 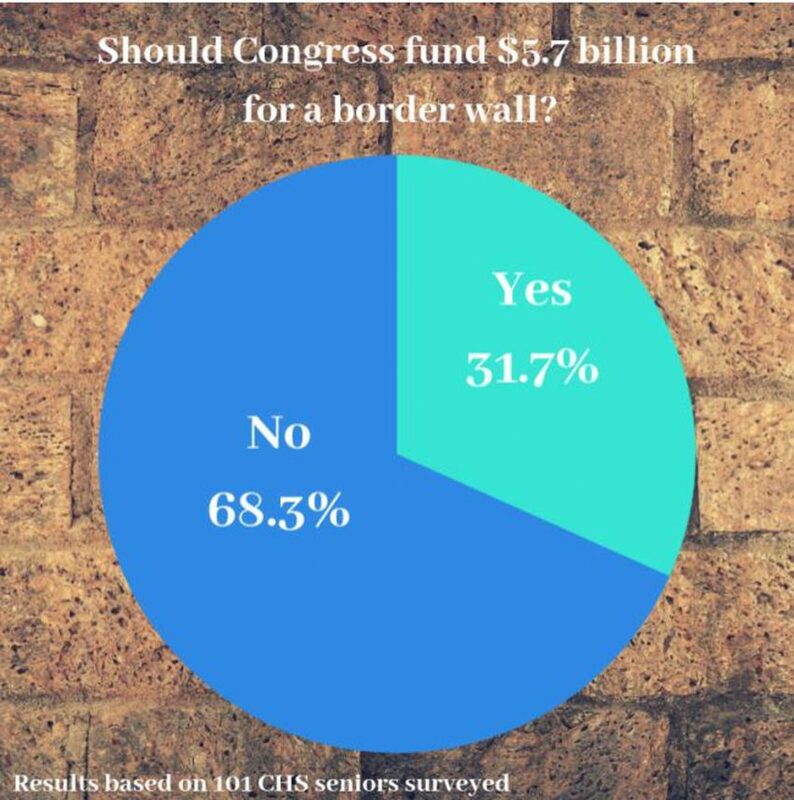 35 percent of seniors who took the survey cited that Congress should agree to sign a bill that calls for $5.7 billion to put towards a border wall. White is among the minority at CHS that believe it’s crucial for a bill to be passed, calling for funding along the border. White isn’t alone. One senior says that the majority of illegal drugs come from the southern border, and the wall would help slow down the flow of illegal contraband. Another student mentions that people needed to be accounted for in the U.S. In a report from earlier in 2018 based on internal Customs and Border Patrol documents from the fiscal year of 2017, Border Patrol agents cite needs for more technology and increased personnel in order to curb the problem at the border. The report concluded that only half of one percent of Border Patrol agents’ concerns mentioned the inclusion of a wall. While the partial government shutdown recently ended, the agreement will only open the government for three weeks. While negotiations at the White House continue, debates among students will go on.